Charly is a sweet little girl who was born in 2014. She joined her family through the gift of adoption, from foster care, when she was 3-years-old. At only 3-weeks-old, before she was adopted, little Charly suffered major physical abuse under the care of a family member, who was under the influence of drugs. Charly was in the NICU for 3-weeks, recovering from multiple brain injuries. She also required the use of a feeding tube and underwent several plastic surgeries to repair a major injury to her nose. The aftermath has left some life-long medical challenges for Charly. She has cerebral palsy, that was caused by her traumatic brain injuries. 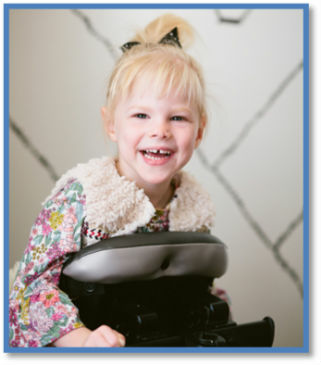 Cerebral palsy is a condition that can affect every function of the body. Because the damage has occurred in the brain, many cognitive signals get interrupted, causing the body to operate incorrectly. In Charly’s case, cerebral palsy has kept her from gaining the ability to walk or stand independently. She has limited speech capabilities (about 8-10 words), and her vision has been greatly impaired. Charly is currently enrolled in speech, occupational, and physical therapy. She also requires the use of a wheelchair and leg braces. This 4-year-old little girl is one of the sweetest, most smiley-social little girls you can meet. She is extremely determined, and has already proven that she will not let set-backs keep her down. Charly has been described by her parents, as a very nurturing little girl. She is drawn to babies and dolls, and plays so gently with them. She also loves her big sister and two brothers. Charly will be adopted as a Sparrow to Hoover Elementary School. Students at Hoover will work hard to raise money for Charly through sponsored community service and fundraising projects.